I attended a totally awesome solar cooker festival the weekend before last in Sacramento. Building a solar cooker now tops my to-do list, but I haven’t had a chance to even look at plans, much less build one. However, I did discover that we have a solar cooker and a solar food dryer here at the community! Our manager, Chidambar, dug out the solar dryer, which he built (it’s wonderful!) and lent it to me. I’ve been having a blast testing it out this week. 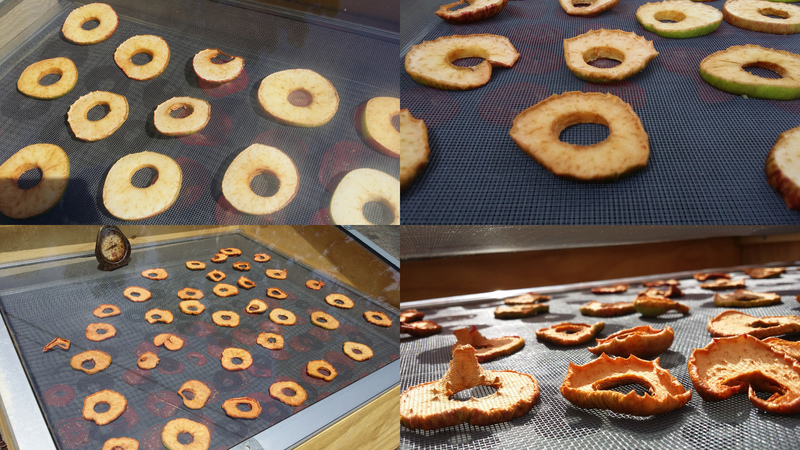 I dried apple rings first. The solar dryer works extremely well. It’s basically a wooden box topped with a glass window pane, with a hinged opening on the back, the whole thing raised on four legs. Inside the box sit two horizontal screens, which you can easily pull in and out of the back of the box. Under the screens sits a matte black piece of thin metal. A piece of wood covers most of the outside bottom, with a four-inch wide opening across one end, protected with window screening. That gap plus two small vents on the side help keep the temperature at an ideal range for dehydrating—and not cooking—food. I was amazed when I first noticed this baby had reached a temperature of 175ºF. Now, I realize not everyone has a solar food dryer kicking around. If you want to build one, you’ll find many excellent plans online. Or, if you have a pilot light in your oven, or turn the heat on very low, these should turn out well (I haven’t tried that though). 1. 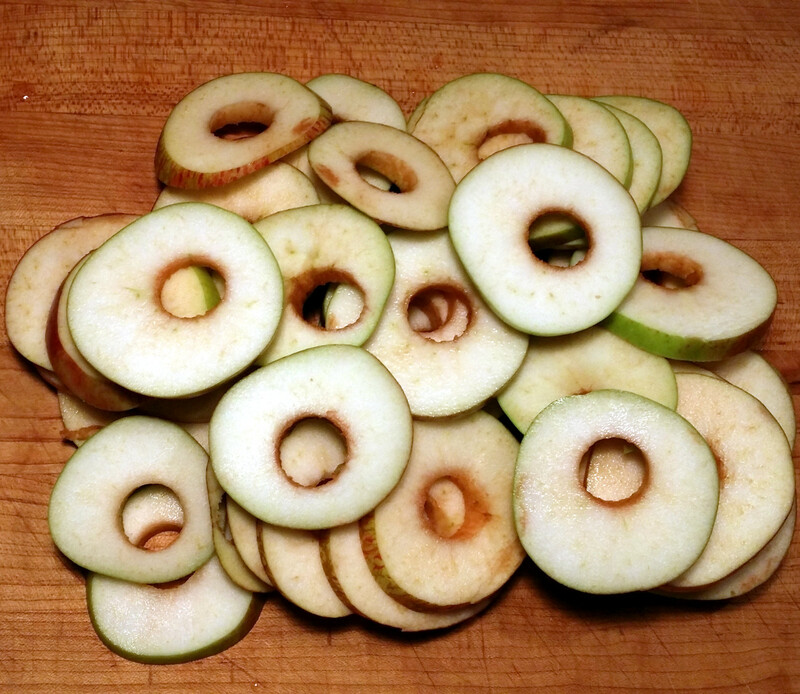 Core apples and cut into 1/4″ slices. 3. 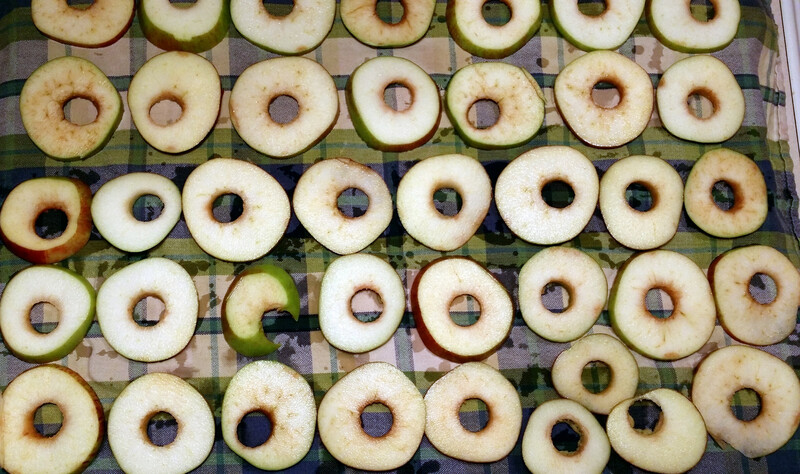 Remove the apple slices and allow them to dry for 10 minutes. 4. 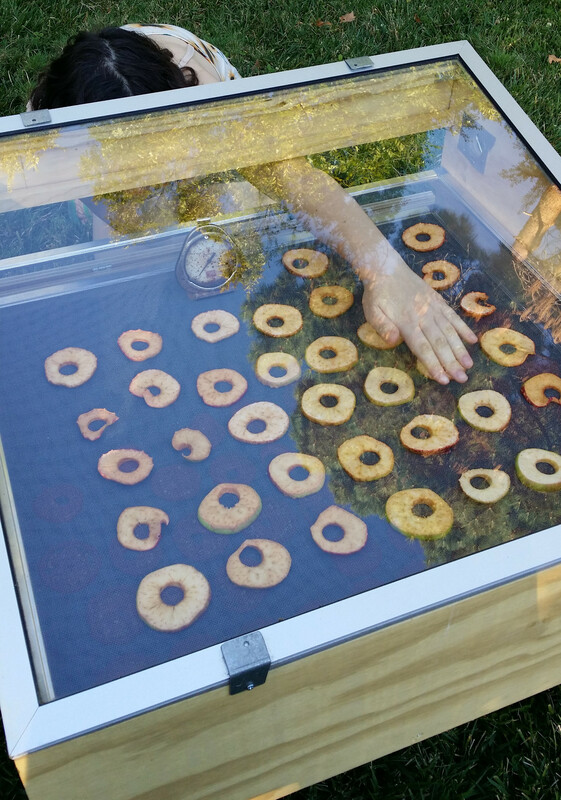 Arrange the apples in the dehydrator so that no slices touch each other, allowing the air to circulate. Place the dehydrator in the optimal position for catching the sun’s direct rays. You’ll have to adjust it every once in a while as the day progresses. I turned it a few inches every hour or two. These shrink so much, I thought someone must have been eating them, they looked so sparse after just a few hours. I did catch one thief! 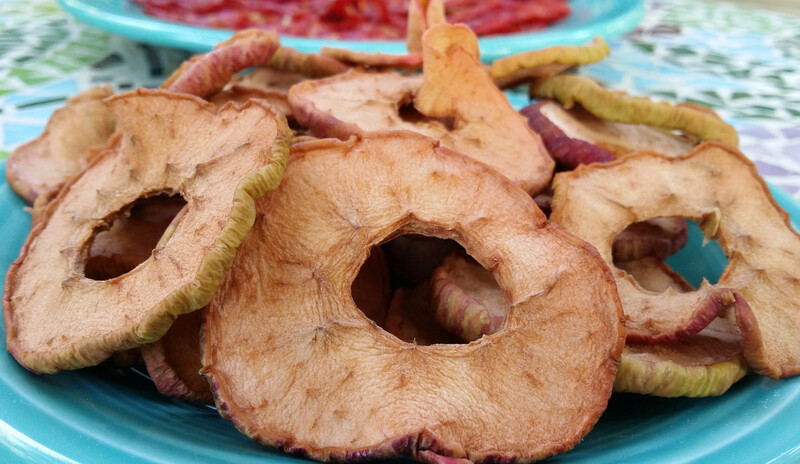 These dried apples are delicious—very sweet and chewy. Before this past Sunday, I had not seen apples at my farmer’s market. 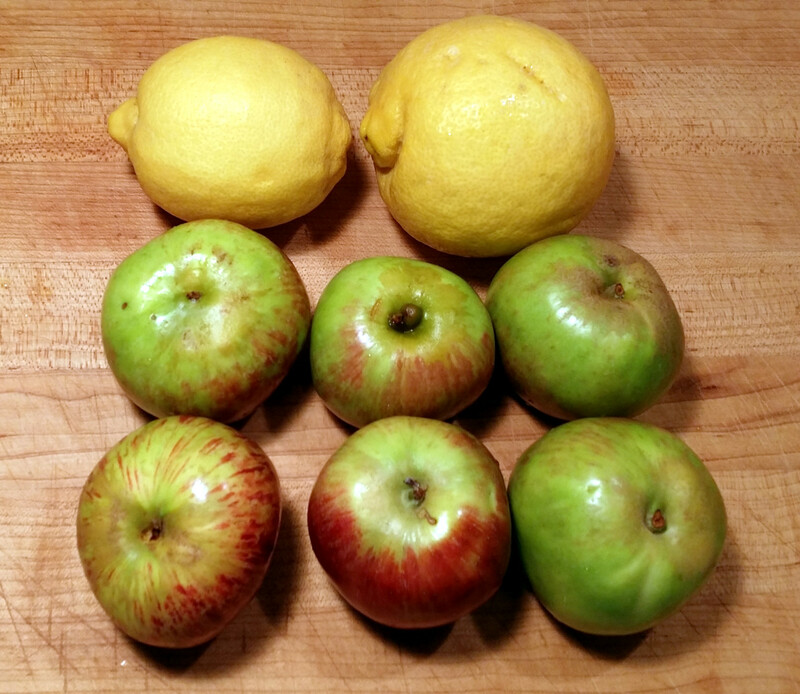 Ideally, when the market overflows with apples and the price plummets later in the season, I would dry a barrel or two of them, dehydrate them and store them in glass containers through the winter. They make a nice addition to trail mix, steel-cut oats or muffins. Apparently they keep for a year, but we ate this first batch. This recipe is about as close to zero-waste as I can get. The lemons came from the yard, the apples, from the farmer’s market in one of my homemade cloth produce bags and the energy, from the sun. That’s awesome! How tasty and energy efficient and a great way to use a glut of apples! Thank you 🙂 In a couple of weeks I hope to dry many pounds of tomatoes when the farmer’s market stalls are bursting with them. Solar dryer, that is too good!! what a great way to save electricity and use the solar energy!!! Thank you! I’m looking forward to trying all sorts of experiments with the dryer. Thank you! It’s been fun trying different foods in it. Thanks for posting this design. I have used the dashboard of a car, which works pretty well, but this looks a lot more reliable. And yes, now I have learned to dehydrate tomatoes, it is by far the best way to preserve them. That’s fantastic! 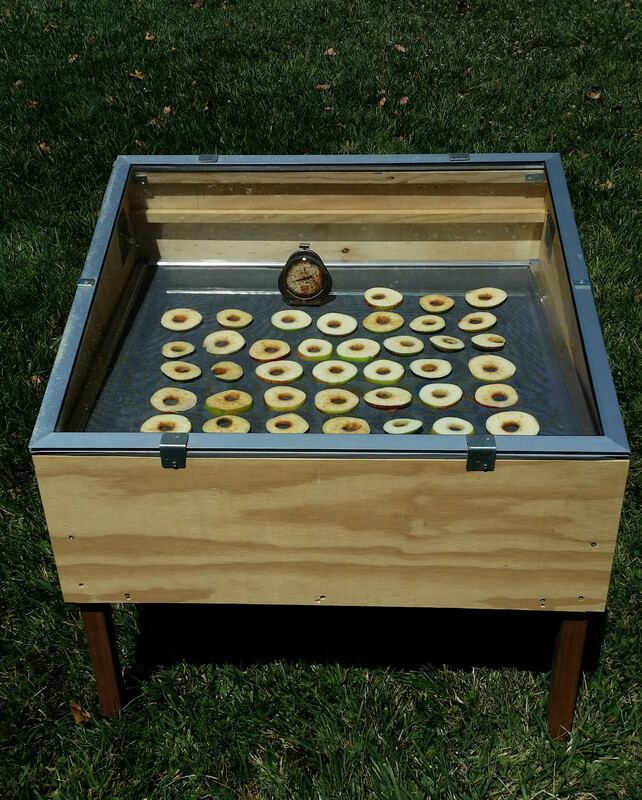 What a great way to dehydrate fruits without using electricity. Thanks for sharing! nice..they do it here but don’t know how..thanks for sharing. I do have a solar cooker..I don’t use it now as it has to be moved with the sun..and I am at work. My mum used it though.. There seems to be not much difference between this and a food dehydrator.